To read the winning entries from our first competition just click on the links below and scroll down to view judges’ comments. *Disclaimer: It should be mentioned that some of the content of 2007’s winning poem may offend some readers. 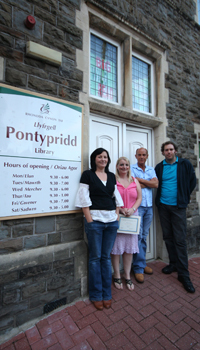 A prize giving evening was held in the main library in Pontypridd, Rhondda Cynon Taf, South Wales on Wednesday 15th August, 2007. 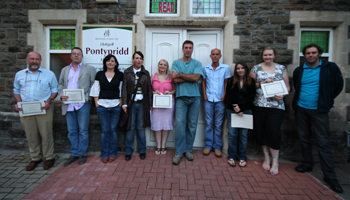 The winning poems were published in the Welsh Academi’s Literary Magazine A470 as well as on their website. We have also informed the local and national press. An excellent poem. Filled with the sound, rhythms, and musical qualities of language. Alliteration, and assonance, pushing each line along relentlessly. The mind is drawn onwards, and onwards, towards meaning, towards an end; each point picked up and qualified by a clause or phrase, then thrown down to be picked up again later; the language creating a speed and urgency, as we move at times beyond meaning, and a refusal to let this jaggedness slow us down. There is no gap between his words and the world. Poetic utterance at it’s very best, and a very worthy competition winner. From doodlebugs, to ebay, to Buddha…”War makes beasts of us all”. 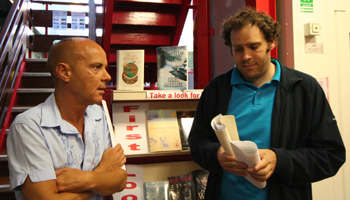 Poetry will only survive as a relevant art form if voices like Gavin Price are heard more often. Another excellent poem, finely observed and executed. A female voice speaks with candour about the changes and bodily experiences of the aging process. Making use of the subtle effects of sound, which contrast wonderfully with the matter of fact, frankness, and sometimes harsh way the poet addresses the reader, and herself. “On honest reflection in the mirror”. Yet there is humour in this self-portrait, “Arse. A moon with craters. Men don’t want to land”, and all the complexities of emotion are addressed, “Of the inside out. Rockets. Shooting, steaming, simmering, exploding”. This poem by Eloise Williams would win many competitions. Poem as creative art. Another poet whose voice needs to be heard. Again, an excellent example of how poetry should be written in the twenty-first century. There is no pretension, both language and subject matter speak directly to the reader. The speaker faces the pain of miscarriage, “He left a space. Never knew he was a “he” until the post mortem. The little life. I never saw his face.” Loss. Mourning. Pain. Self-doubt. Difficult subjects. Nothing is dodged or ducked. Are all tackled head on. “He left despair. A freak with bad insides. A child I could not bare.” The use of rhythm and the subtleties of rhyme are expertly crafted. Amanda Weeks is another poet who has a finely tuned ear for the aural patterning of language. Honest, open, and deeply moving, a poem which thoroughly deserves it’s place among the competition winners. More please. Great poems here, very moving!